While surfing the internet you might like some videos, and you want to save them for the view it later, or you want to share them with your loved ones. But all online sites do not let you download its content like audio and videos. That’s why the users have to use any powerful third-party application or software which can download the videos from all the sites hassle-free. There are lots of options available online which can be used for this purpose, but Videoder is the best video downloader for Android as well as Windows and Mac. Videoder is a powerful tool which lets you download videos from YouTube, Instagram, Facebook, SoundCloud and several other online streaming sites for totally free directly on your PC or Android devices. You can choose the quality in which you want to download any video, from the different quality options depending on the uploaded video. The video quality may vary according to the videos, with Videoder app you can download high definition videos from 240p to 720p, 1080p, 2k, and 4k depending on the quality uploaded in MP4, FLV, and 3GP formats. With over 70 Million downloads all over the world, it is the most trusted and popular video downloader tool among the Android as well as Computer users. Videoder app is considered to be the best Videoder tool for Android and PC. 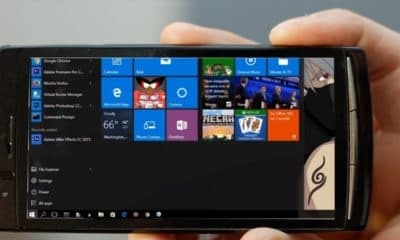 MUST READ: Showbox APK 2019 Download. Videoder app is available in English and other 33 languages. If you don’t want to download its desktop or Android client, you can download any video from its online video downloader feature. Users just have to copy the link of any video they want to download and paste the link in the bar. We will teach you how you can download videos with Videoder online and with its application & desktop client. You can download movies, music, and videos you watch and hear online for free. It supports more than 1000 sites with its PC app, so with Videoder, you can download videos like Vimeo, Dailymotion, TikTok, Voot, Twitter, 9Anime, Ozee, VidMe, 9GAG, AudioBoom, and many more. Users can also request the developers to add a site by dropping them a mail at [email protected] It is one of the best alternatives to Tubemate on Android platform. Batch Downloading – You can make the collection of videos and songs and set them to download in just some clicks. So you can use its “multiple downloading” feature. 10X Faster Downloading – It uses several network connections to boost the downloading speed. You can manually set the number of connections as per your network quality to gain maximum downloading speed. Cover art and audio tag editor – You can get original cover and mp3 tags, or you can set them according to your needs. Smart link detection tool – this one of the best features of Videoder, whenever you copy a link of any video or any media file, Videoder automatic detects it and shows the popup to download it. Unlimited Themes – You can customize Videoder according to your preference. Choose any color from the palette or use any of the preset themes. Download YouTube Playlists – You can make playlists of videos on YouTube, and you can click the whole playlist at once. Inbuilt browser – Its inbuilt browser makes it easy to download videos from multiple sites since it detects the media file or video and shows you a download popup. It also blocks Ads on the Web. Quick download tool – With its quick download option you can download videos without waiting for the links to load or when you are in a rush. You can download videos in just two simple steps. Night Mode – Night mode feature is available for users to make it easier for users to use Videoder in the night. It is most recommended for AMOLED screens. Installing and using video to download videos from various sites is as simple as ordering a pizza online. 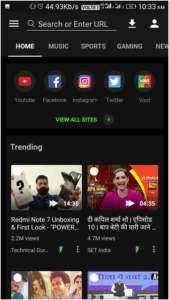 On the mobile app, Videoder APK supports and can download videos from more than 50+ sites like Instagram, Youtube, Hotstar, Facebook, Voot, VK and many more. Many new sites are being added as per the users’ requests every week. 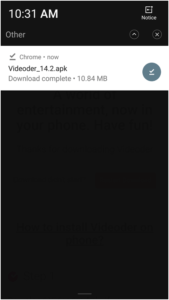 Learn how to download Videoder APK and step by step guide on how to download videos with Videoder APK. Step 1 – Download the latest Videoder APK from its official site. Step 2 – Wait for the Videoder app download to complete and tap on it once it completed from the notification panel. Or you can find the downloaded Videoder APK file in File Manager to install it. 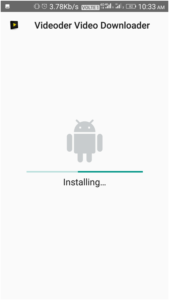 Step 3 – Android setting may not allow you to install the app from unknown sources (other than Play Store). If you get the popup as shown in the image given below, tap on Settings and proceed for the next steps. 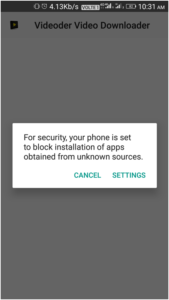 Step 4 – It will directly open the setting page of “Unknown Sources,” or you can open “Security settings” in “Settings.” And turn the toggle beside the “Unknown Sources” option. Step 6 – Open the app from your Home Screen and free download videos from YouTube and many other sites for free. Downloading videos, music and other media file are super easy. You can download and convert videos from YouTube. Download mp3 from SoundCloud, videos from Instagram and Facebook. The whole tutorial is given below. Search – Search the songs or videos that you want to download. Or you can make playlists for batch download. Choose – Now choose the media file you want to download from the search results. Download or Play – Now you can play or download the video directly from the given options. Set location – After the selection of the resolution a dialogue will appear which allows you to change the location of your download and you can set the number of threads for fast download. Download Starts Now – Now tap on the download option, and your download will begin. Click on the download icon on top of the screen to open your downloads. 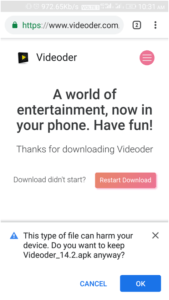 Whenever you open a media file in any site or online streaming app, copy the link of the file, and you will get a popup saying <Do you want to download this media with Videoder?>. Click on download button shown there in blue color. Select Quality – Now choose the quality from the options you want. Now download will begin automatically in the Videoder app. You can manage your downloaded files in the Videoder application. You can download videos, music and media files from more than 1000+ sites with Videoder for PC. Desktop client of Videoder is available for both Windows and Mac. Step 2 – Open the installer file from the “Downloads” folder in PC and double click on it to install the software on the PC. Once, the Videoder App is installed on the PC. All it takes just three steps to download videos and media files from 1000+ sites. Step 3 – Copy video URL from Facebook, YouTube, TikTok, Instagram, Hotstar, Voot or whatever site you are looking. Step 4 – Paste the link in the Videoder app or you can also search video directly from Videoder app. Step 5 – Now select the quality of the video download the video you want. If you don’t want to download its Android or PC client and want to use it online, then it super easy and handy to use and download videos from many sites. Step 1 – Open its official Online Video Downloader feature from the given link. Step 2 – Search any video or media file and copy its link. Step 3 – Select the resolution and quality in which you want to download the file. Step 4 – Click on the quality and start the download. So after doing the whole research, we have provided you the best and easiest ways to download Videoder for both Android and PC. Videoder is one of the best video downloader apps available in the market. 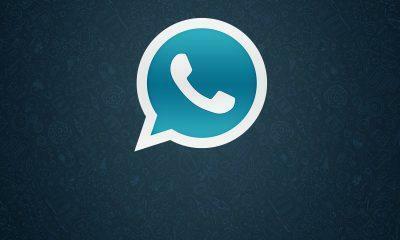 You can download almost every media file from the internet with the help of this app. You can also download videos from its online video downloading option. If you like the tutorials given above and if you like the way Videoder works, you can share this post with your friends & family and let them know about this awesome tool. If you know any other such powerful tools, you can tell our users about them in the comment box. Any feedback or suggestion from is always welcome through the comment section.